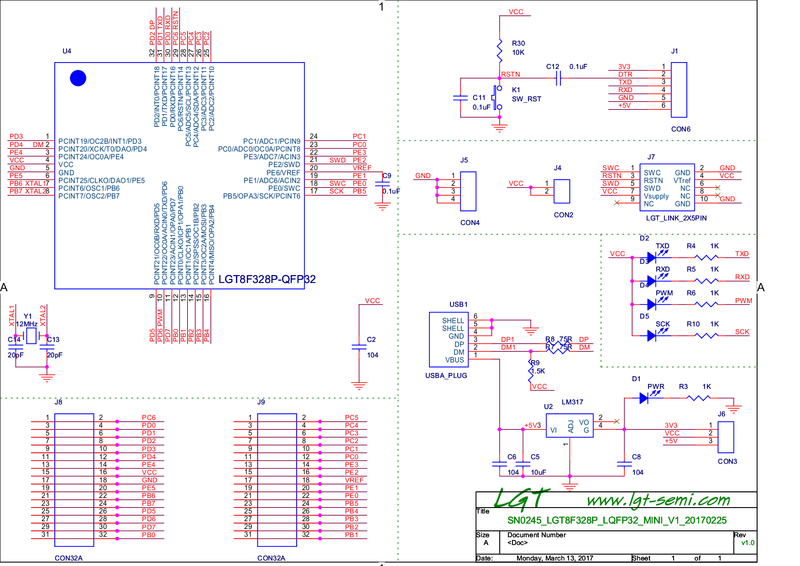 Arduino compatible boards are normally using Microphip Atmel microcontrollers, but as we’ve see with GD32 clone of STM32 MCU, some companies are making MCU clones too, usually with some improvements, and LogicGreen designed LGT8F328P micro-controller (mostly) compatible with Atmel ATMega328P micro-controller and adding features such as DAC output, PWM specific features, a computing accelerator (DSC), and others. The MCU also runs at double the clock speed (32 MHz). 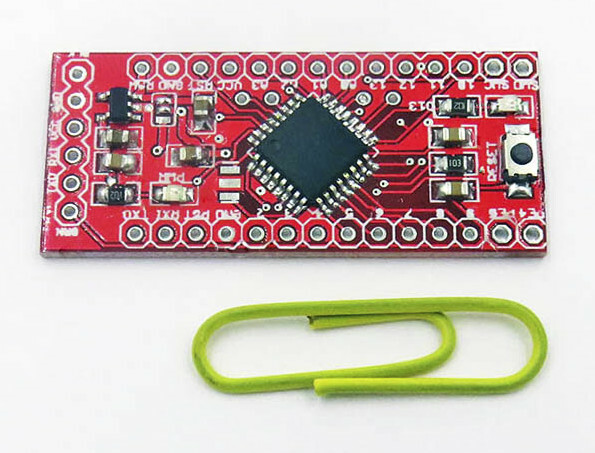 I found out about the new MCU via Electrodragon selling EDMINI Arduino compatible development board based on LGT8F328P micro-controller for $1.40. The board looks to be a clone of Arduino Pro Mini. The board does not include any external crystal, as the IC embeds a 16Mhz crystal internally. The board comes pre-loaded with a bootloder for the MCU, and you can programming it with Arduino IDE directly. 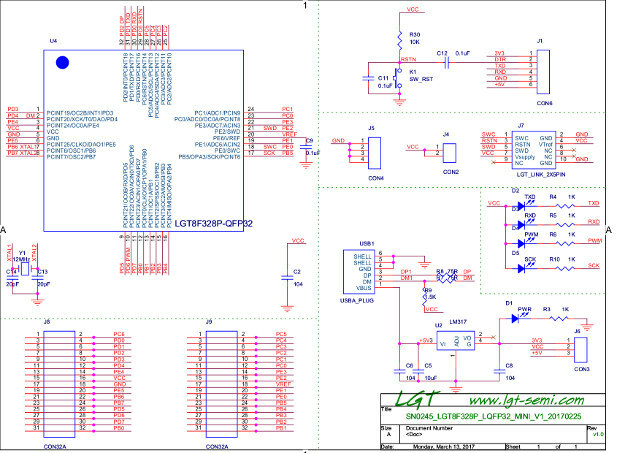 Electrodragon also provided more details in their Wiki, and some documents and tools (schematics, SDK, 8F328 datasheet (in Chinese), etc..) can be downloaded directly on LogicGreen website. The MCU extra features compared to ATMega328P are shown in the comparison table below. If you can read Chinese, you should also find more information on the product page. GD32 chips with 20Kb of SRAM or less have no more than 128KiB of flash, so all flash content is served from SRAM. This might also mean that startup time is slower than one would expect. With this SRAM mirroring it is not surprising that GD32 is beating STM32 in performance even on the same frequency and loosing in idle & sleep power consumption. Cute! If you’ve got time to waste on reset and power to waste during idle and sleep, it looks like GD32 wins. It isn’t product for me. I don’t want to research where is 1 % incompatibility. I also found Wemos has a similar board named Arduino XI the same chip with Arduino IDE support. Careful of RAW input. I hooked up a 13.2 VDC wall brick to it and blew the on-board LM1117 which should be rated for up to 15V.